(Inside Science) -- In the wizarding world of Harry Potter, owls are magical companions that deliver the post. But in Indonesia, wild owls are stolen from their nests and put in cages in pet markets next to hundreds of winged neighbors. Before J.K. Rowling wrote about Harry’s snowy owl Hedwig, Indonesians rarely kept owls as pets. Now various kinds of local owls are staples in pet markets. Vincent Nijman and Anne-Isola Nekaris from the Oxford Wildlife Trade Research Group in the U.K. believe this attention toward owls may be partially linked to the “Harry Potter” series, and they fear the new demand rewards an environmentally destructive pet industry. Bird keeping is a popular pastime in Indonesia. While only 3 percent of American households own birds, roughly 20 percent of urban Indonesian households have feathered pets. A survey estimates that 2.6 million birds are acquired each year. Birds are especially popular in Java and Bali, two southern Indonesian islands, and the larger markets there hold more than 16,000 birds on a given day. Birds also have special meaning in Indonesian culture: A Javan proverb claims that a fulfilled man must acquire a house, a wife, a horse, a dagger and a bird. In the saying, the bird symbolizes the importance of maintaining a hobby. Vincent Nijman, an anthropology professor at Oxford Brookes University who holds a doctorate degree in ecology and conservation biology, has studied Indonesian bird markets for more than 20 years. Before the 2000s, he would spot one to two owls, if any, in these shops. Now they’ve become a constant. “Often we see dozens of them -- up to 30, 40, 50 owls,” said Nijman. The most common owls in these markets belong to several similar species called scops owls, which are the smallest and cheapest owls available. 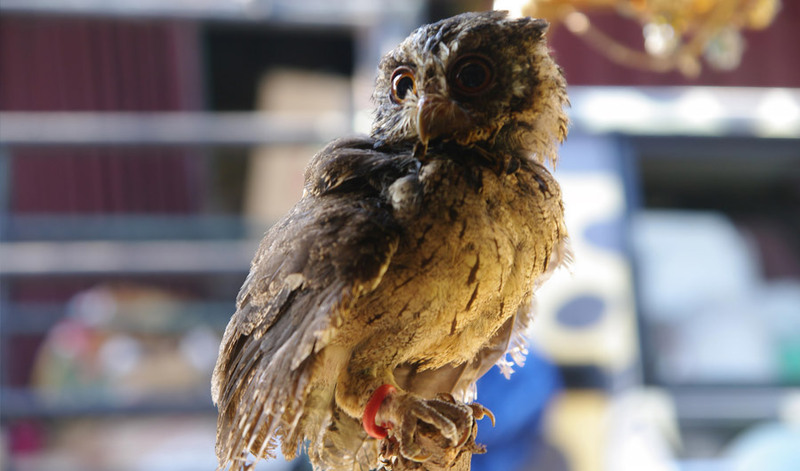 In 2016, TRAFFIC, an organization dedicated to monitoring wildlife trade, found that the Sunda scops owl was particularly popular among bird keepers. This type isn’t considered to be threatened, but some of its 15 Indonesian scops relatives, like the Javan and Siau scops owls, are vulnerable to extinction. To determine if the rise in the owl trade correlated with Harry Potter's popularity, Nijman and Nekaris organized 109 bird population surveys across 20 markets from 2012 to 2016. They also assessed more than 30 years of market reports, quantifying the owl trade from 1979 to 2010. From this collective analysis of more than 400,000 birds, Nijman and Nekaris found that before the 2001 film release of “Harry Potter and the Sorcerer's Stone," owls represented less than 0.06 percent of all birds for sale. Since 2008, they’ve made up over 0.43 percent, a sevenfold increase. Their results were published last month in Global Ecology and Conservation. Even though owl popularity in Indonesia is correlated with the “Harry Potter” craze, this does not prove that “the boy who lived” directly caused this trend. Non-wizarding factors may have influenced owl sales as well. For example, Nijman and Nekaris are quick to point out that the owl trade increased alongside the rise of pet owl interest communities, especially ones online. “We see it in other places in Asia as well -- there is a very, very strong social media presence of owl lover groups,” said Nijman. These online communities did not exist before the 21st century; in 2001, only 2 percent of the country could use the internet from home. Now approximately half the population can tap into the web. Regardless of how owls appeared in bird markets, Nijman thinks the trend may impact wild populations. Almost all local birds found in Indonesian markets are wild-caught, and in some cases, birds are hunted to extinction or near-extinction. Owl trading is a particular concern for Nijman since the birds are important fixtures in Indonesian forests and farmlands. As top predators, they keep prey populations in check and help eliminate agricultural pests. Owls also face other threats, such as deforestation and harmful pesticides. “And now you have people going out looking to trap them. It’s the final whammy,” said Paul Jepson, a conservation expert from the University of Oxford who was not involved in this study. To address the potential threat owl trading presents, Nijman and Nekaris propose that the Indonesian government place owls on the country’s protected species list, making wild owl trade illegal. However, it’s not guaranteed that calling owls protected would preserve populations; other protected birds still find their way to markets. Jepson says the protection list is well intentioned, but lacks cultural and legal enforcement. “It’s just normal keeping a bird. We don’t imagine trying to stop people in the U.K. from keeping dogs or cats,” said Jepson. He says that additionally, the Indonesian police force doesn’t have the capacity to catch and prosecute wildlife traffickers in forests or markets.